Citation: C N Trueman "Irma Grese"
Irma Grese, a notorious SS guard at Auschwitz-Birkenau and Belsen, was probably Nazi Germany’s most infamous female war criminal of World War Two. In all the death/concentration camps in which she worked, Grese gained a reputation for brutality against those held in any of the camps she worked in. At Auschwitz-Birkenau, she held the rank of Senior SS-Supervisor (Oberraufseherin) and was in charge of the 30,000 female prisoners held there. After the war Grese was accused of torture and murder at the camps she worked at. Some at her post-war trial believed that she was personally responsible for 30 deaths a day at Auschwitz-Birkenau. Grese was accused of setting her dogs on to prisoners and whipping others to death. Evidence, disputed by some, stated that she had lampshades made from the skin of the human victims at the camps she worked at. Grese was born in October 1923. Her family was involved in agriculture and when she left school aged 15, it was expected that she would follow in the same employment. This happened as Grese worked on a farm for six months and then in a shop. She then worked in a hospital and moved to the all-female Ravensbrück concentration camp in July 1942, the year in which she joined the SS. In March 1943, Grese transferred toAuschwitz-Birkenau. With Nazi Germany’s withdrawal from Poland, Grese moved back to Ravensbrück in January 1945 and then on to Belsen in March 1945. In June, 1945, Grese was indicted under a Royal Warrant by the British. Captured at Belsen in the last days of the war, Grese was charged with crimes against humanity in the Belsen Trials held between September 17th 1945 and November 17th 1945. Grese, aged just 21, was found guilty of her crimes and sentenced to death. 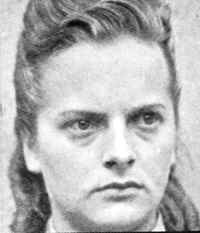 On December 13th, 1945, Irma Grese was hanged.